Jen Gotch has been around the block a time or two. She has worked as a bartender, a cleaning lady, an art teacher, barista, rickshaw driver, molecular biologist, photographer and prop stylist. Ok, one of those may have been a lie, but only one, she swears! She now serves as the Creative Director for Ban.do, a company she founded with a friend in 2008. Watching this company grow from a small vintage, one of a kind hair accessory company that operated out of her living room to a multi million dollar gift, tech and fashion accessory brand has been one of her greatest joys in life. 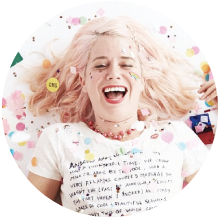 Her passion to continue to grow this uber fun brand, while sharing her experience along the way with others who are interested in taking the same path, so as to inform their journey and maybe help them avoid some of the hard stuff. Although she whole heartedly believes its the hard stuff that makes us who we are.